THOUSANDS OF PROTESTERS marched down Washington DC’s iconic Pennsylvania Avenue today, arriving at the Capitol to call attention to the deaths of unarmed black men at the hands of police and call for legislative action. Also speaking were civil rights leader The Rev. Al Sharpton and family members of Eric Garner, killed by an officer in New York in July, and Tamir Rice, a 12-year-old killed in Ohio as he played with a pellet gun in a park. Several speakers asked the crowd to chant, “I can’t breathe.” Garner, 43, had gasped those words before his death while being arrested for allegedly selling loose, untaxed cigarettes. Some protesters also wore those words on shirts. Then, blocks of tightly packed people moved through the city. Organisers had predicted 5,000 people, but the crowd appeared to far outnumber that. In New York, thousands marched through Manhattan, congregating in Washington Square Park. 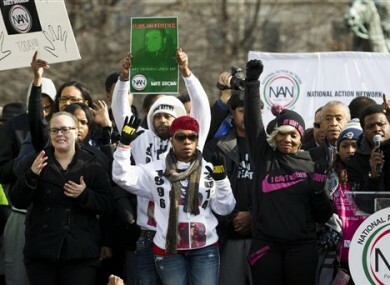 Email “Thousands march in Washington and New York to demand action on police killings”. Feedback on “Thousands march in Washington and New York to demand action on police killings”.